The smartphone application, KAPTAN, gives mariners access to surface currents in the Malta-Sicily channel in real time. On the App Store is the 6th ranking weather app in Malta! The data for this integrated service to mariners is mainly derived from the Calypso HF radar observing system, consisting of HF radar CODAR SaaSonde installations on the northern Maltese and southern Sicilian shores at four selected sites. Satellite observations added to high resolution weather and marine numerical models, run at the University of Malta specifically for the Malta-Sicily Channel, provide a full suite of very local reporting, and complement other weather forecasts derived from GFS/WRF models and local weather stations. The KAPTAN app can be downloaded by individuals and used by mariners, sportsmen and hobbyists to complement information obtained from weather forecasts. The KAPTAN app can be downloaded for free for both Android and iOS devices from Google Play and App Store. The same services are also available online. The CALYPSO infrastructure is also currently used by the AFM for search and rescue operations. The KAPTAN app is protected by copyright. In Malta the Copyright Act applies. 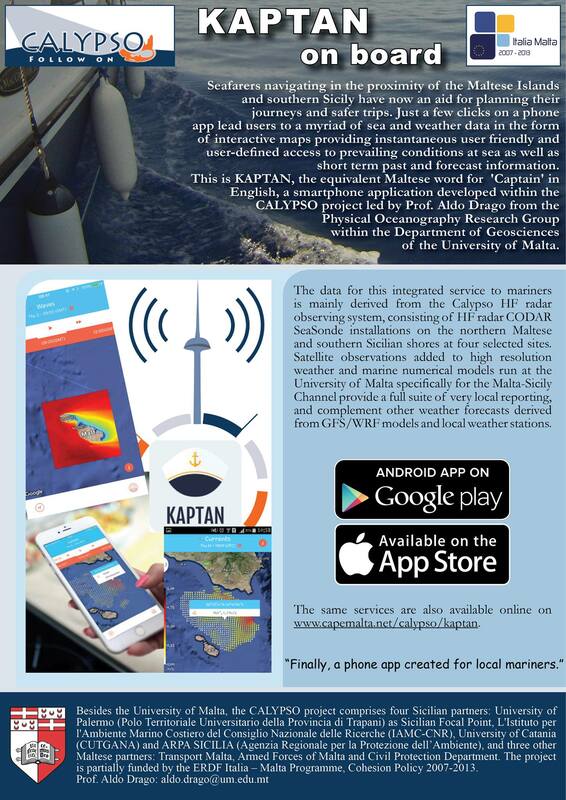 Data generated by the CALYPSO project is made available free of charge online. For companies wishing to work with the University or obtain a more bespoke service with respect to surface currents, we are always looking for further applications of the technology and collaborations with industry. Feel free to contact us.